From gas leak detection to installing a new heating unit R.J. Riquier has you covered. No matter how big or small the job is our professional staff will give your job a personal touch. Connecticut winters can be brutal especially if your home is not heated properly. At RJ Riquier we specialize in heating solutions that are efficient and affordable. Is your furnace more than ten years old? Do you feel that your current heating solution is not keeping your house warm enough? Are you looking for a more efficient way to heat your home in the Windham, CT area? A new gas or oil furnace can make your home heating up to 30% more efficient. That is ALOT of warmth! Choosing between gas and oil heating is going to depend on many different factors including your personal preference along with your budget. Both your short term and long term budget goals will need to be examined. Typically, gas furnaces will have up to a 10% higher heating efficiency rating than an oil furnace. However, an oil furnance is going to cost up to 25% less than a gas furnace. This along with many other factors will determine which solution is best for your needs. At RJ Riquier, we will work with your budget, listen to your heating requirements and go over the best solutions with you one on one. 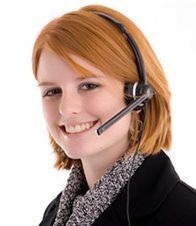 Call RJ Riquier at 860.423.0677 today to speak to our professional staff about a more efficient heating solutions. From office buildings to homes, our friendly staff can provide you with a heating solution that will keep you warm in Connecticut’s harsh winters at affordable price. From clogged drains to installing a new toilet R.J. Riquier has you covered. No matter how big or small the job is our professional staff will give your job a personal touch. 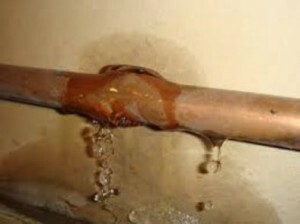 We have been fixing plumbing problems for over 50 years! Do you have annoying leaky sink? Thinking about replacing your old toilet? Want to upgrade your bathroom ? The country has changed with regard to kitchen and bathroom faucets. Federal law now requires that all plumbing products be lead free. I suppose that this is a good thing in some ways, but I’m still a bit old school about this. I like a good, old fashioned chunk of brass for a faucet. Something that is solid, strong, and lasts for 40 years or until the customer gets sick of the look and wants a change. Like classic cars and everything else in modern life, things change and we all need to adjust and embrace modern thinking and technology. The classic brass faucet has largely been regulated out of existence like the incandescent light bulb. With today’s regulations, faucet manufacturers have switched to the use of stainless steel, lead free brass, or plastic. Stainless steel and lead free brass are expensive, so to remain competitive, most major manufacturers have been pumping out plastic faucets. They are not necessarily less expensive than their previous products, but a lot are absolute junk. Brand name is no longer a reliable indicator of quality in the plumbing fixture market. Sad but certainly true. The big box stores do an excellent job of displaying plastic faucets by putting them up high, hiding the working parts and allowing the customer to merely look at them from a distance. Shiny chrome looks good and a cheap price looks even better. My suggestion is that you consult an honest, reliable, local plumber who has put in perhaps thousands of faucets. Ask what they recommend or have in their home. Ask what will last the longest, if that is your desire. For a rental, ask what is the strongest with least maintenance over time. If you desire an inexpensive option, we all have those available too. By law, a licensed CT plumbing contractor must guarantee the product they sell you for one full year minimum. If the customer buys the faucet themselves, sure we’ll install it, but the product guarantee is all on the purchaser. Who you buy from and what you receive is far more important than just getting a mini-split system installed. A lot of “contractors” are jumping onto the mini-split craze and the trend is expected to continue but there have been major issues. Many manufacturers are selling various systems to try to get a piece of this hot market. Some are excellent, some are okay, many are absolute junk! Stick with a time proven product from a reliable company. A trend we are seeing a lot of is the quick, cheap install. Installed improperly, many of these units will still run fine, for about 18 months. At this point, many simply die. This is often due to a lack of proper pressure testing and not putting the system into a proper vacuum. The pressure test is at over 400 psi for a minimum of one hour. These units require putting the system into a vacuum three times, each time breaking the vacuum with nitrogen. Additional refrigerant is often needed and this must be precisely weighed before adding to the sealed portion of the system. All of this work takes time, knowledge, and proper, calibrated equipment. Again, I want to stress that a mini-split will run for some time with an improper install. With the cost of this high tech equipment and the precision needed to keep them running in order to get long term payback on your investment, a top quality install is vital. Don’t buy a Porsche from the guy who changes the oil on your old pick-up truck and don’t expect to win the Daytona 500 in a Kia. When To Get Your AC System Serviced? Spring is here and although it may seem a bit away, summer is coming! We are often asked, “When should I get my AC system serviced”. The simple answer is in the spring. The best time for AC service is well before the season begins. Proper AC service involves changing the indoor filters that have become dirty with dust, dander, hair and bacteria from the previous season. That’s the easy part. Typically, the service also includes cleaning the condenser coil to remove dirt, plant growth, leaves, mulch and other debris which can be pulled into the unit during normal operation. Much is also a result of winter weather. The condenser coil should also be chemically cleaned to remove oxidation which will decrease air flow and temperature transfer of the refrigerant to the outside air. This is extremely important as without proper heat transfer, the AC system cannot function properly. The result will be improper cooling and excessive electricity usage. On the extreme end, equipment can fail due to excessive wear and overheating. These costly repairs are avoidable with annual maintenance. AC service is best performed when temperatures are above freezing but prior to summer. April and May are the best months for us here in Connecticut. Sure, we do AC service throughout the summer, but these tend to be “emergency” calls because the AC is not working. ALL AC techs are busy in the cooling season and service may be delayed due to an excessive work load on a limited number of qualified technicians. April and May are between our seasonal “crunch” times, between true heating and cooling seasons. It’s not too hot for us or you and we offer great deals. Rest assured, we will work early and late to keep you up and running comfortably and smoothly no matter what time of year, but if you plan ahead, April and May are ideal! Spring is quickly approaching and with it comes gardening, cleaning and car washing. It is also the time of year when the convenient outside faucet is put back into service after a long cold winter. Most modern structures utilize a “frost free” faucet design. Frost free technology places the packing and seat 8-14 inches inside the home or office. These are the parts that actually turn off the water. This feature keeps the water supply inside the structure where the temperature is above freezing and on the warm side of the insulation. The remainder of the faucet is tipped downward toward the exterior so that the faucet can drain outside. This prevents freezing. Some things can cause these systems to fail. 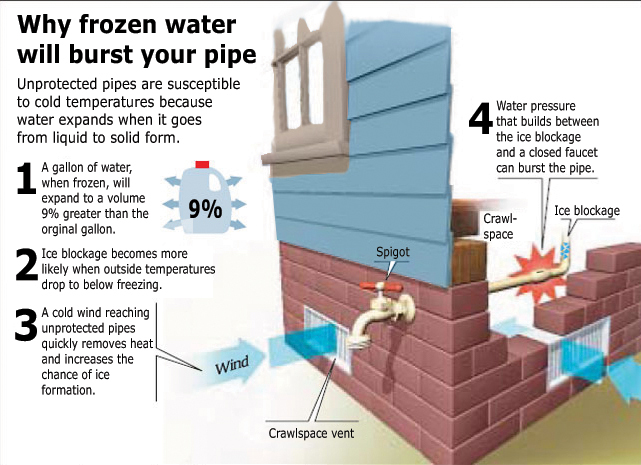 The most common cause of failure is someone leaving the hose on during freezing outside temperatures. If water becomes trapped in the faucet it can freeze and split. Even with good insulation the outside spigot can burst. Insulation does just that. It insulates. 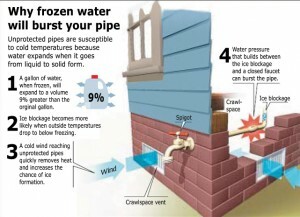 Yes, it helps keep the cold out of your house but it can also keep the heat from a water filled pipe. It is always a good idea to have someone in the basement when you first use your outside faucet. Unlike most other types of plumbing, the split won’t become evident until you turn it on from the outside, but the leak will be in the basement. Play it safe and have a partner live on a cell phone in the basement before you let the water fly. The flood you save depends on it. If you find you have a leak, simply shut off the faucet. No need to shut the entire house off due to this. With all of the snowfall dumped on New England this winter season, we will soon experience a spring “Thaw”. With this comes flooded basements – regardless of whether they are finished or not – water can be relentless and unforgiving. And to make matters worse, most homeowner insurance policies don’t cover flood damage unless you specifically purchased the separate coverage. There are a wide variety of sump pumps out there. They vary in size, power, electrical needs, flexible power sources, and the list goes on. This can be overwhelming for a homeowner. There are even contraptions that are called “puddle suckers”! R.J. Riquier Inc. installs and services a very wide variety of sump pumps. Maybe you’ve had subtle water issues in your basement in the past and want to know some options to prevent the water from ever coming back….maybe you already have an electricity-powered sump pump and want to have a backup one (battery-operated!) just in case….or maybe you’d like to learn more about the sump pumps that run off city water pressure (I know….holy cow!)? Regardless of what you’re considering, give us a call for a free consultation to discuss the options available to you for your budget and needs. R.J. Riquier Inc. can make sure you’re prepared for the “thaw” or can get you fixed quickly should you end up with water issues in your basement this spring. Fight back against the flood and protect your property from flood damage! Call us today at 860-423-0677 for your consultation!